Much is being said these days about blockchain, also referred to as distributed ledger technology, and its impact on business. Let’s be honest with each other: are you familiar with blockchain? If you are not, then the good news is that you are not alone. And if you are extremely familiar, you are in fairly limited company. According to a recent survey conducted by APQC’s research partner, The Center for the Global Enterprise, only about a third of respondents would categorize themselves as moderately familiar with blockchains, and only 6 percent called themselves extremely familiar. 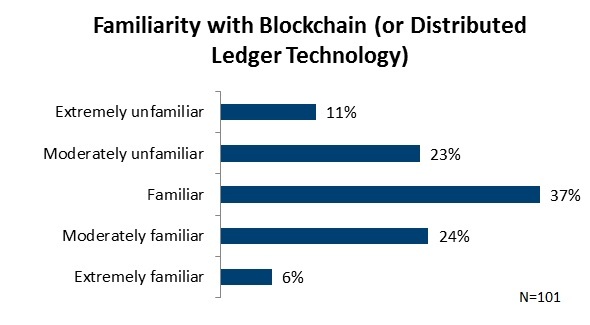 That data isn’t surprising because out of 101 respondents, only 1 percent said their organization is currently using blockchain – certainly not anywhere near widespread adoption. However, ignore this technology at your own peril. 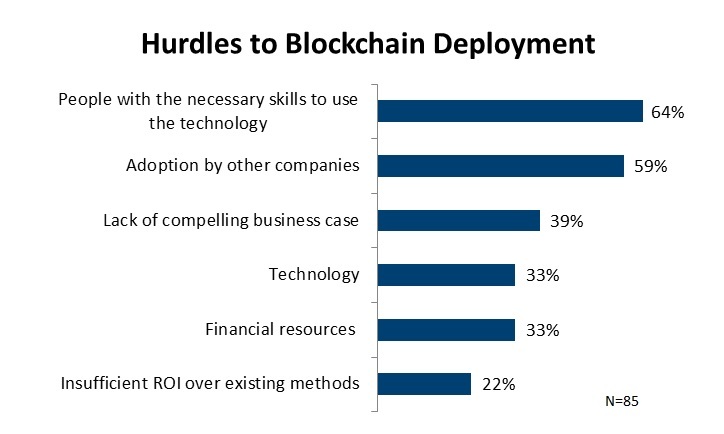 One-third of respondents indicated that their organization is likely to invest in blockchains in the next two years. You don’t want to be the last to understand what it is and what it means for your organization. To discuss the business benefits of blockchains, APQC spoke with Rich de Moll, vice president of blockchain solutions and transformation at IBM. According to deMoll, blockchain is a huge disruptor that provides new capabilities to executives who are finding it harder to continually squeeze more improvement out of their processes and technology. He asserts that 2017 is the year of experimentation, and we will see more adopters in 2018 targeting improvements in costs, transparency, control, and business insight into operational activities. Blockchains are a totally different technology and framework to identify and deliver increased value. They span across business networks, trading partners, buyers, sellers, logistics providers, banks, third parties, brokers, and importers. At the heart of blockchain technology is a ledger distributed across all participants to enable a common view; one version of the truth. For instance, the buyer and seller see the same version of the purchase order and invoice. Additionally, it’s called blockchain because each data element is encrypted in a block. These blocks are chained together across the shared ledgers so it should be much harder to hack it. To learn more about blockchains, read the rest of APQC's interview with Rich de Moll. Thanks for sharing, this is a very popular subject these days. Actually, it's very interesting to see how many people are familiar with it and it's surprising that there are so few of them while the company was founded in 2011. As the cryptocurrency grows in popularity, people start to learn more about it and as a result, Blockchain becomes more popular too. The company was created in 2010, it has a very popular explorer that allows monitoring bitcoin transactions, bitcoin wallet, and a developer platform. Can't explain everything in a few words, but I can share an article that not only explains what is Blockchain but what is Blockchain programming also. Thanks for your comment. I agree that the popularity is growing and more people are learning about blockchains and cryptocurrency. It will be interesting to see the results of the early-stage pilots that some organizations have currently underway. I'd be interested in your article; feel free to email it to me at mbrown@apqc.org. Good solid article for those who might be interested in learning more about this subject. 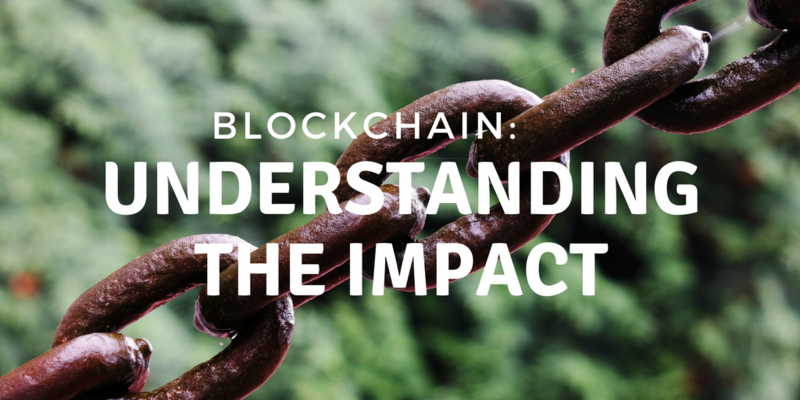 I am new to this subject and recently listened to a podcast that posed an additional consideration in the application of blockchain, finding scenarios where blockchain would be a cost effective and well performing solution. The expert discussed how blockchain is quite applicable in scenarios where the "Byzantine Generals Problem" (BGP) is in play. The BGP is where reconciliation of multiple distributed sources of data is required to a high degree of accuracy. In such cases, blockchain could be applicable. But the expert cautioned against the idea that blockchain is widely applicable to problems where the "Byzantine Generals" problem is not in play. In such cases, blockchain could be overkill, requiring additional costs over a conventional solution. It might also be slower compared to a conventional solution as blockchain processing involves significant processing over conventional solutions. An example might be a bank who is performing reconciliation of transactions that does not involve third parties. In that scenario, a blockchain solution might meet the functional requirements needed but offer no real benefit over a conventional solution (database technology), cost more to develop and maintain. Interesting stuff. I will continue to read articles like the one above to learn more about this emerging technology.